Taking into consideration irrigation implementation, socio-economic and ecological functions, the following criteria were developed for site selection: The main priorities focus on small scale size, economic viability, in line with District Development Plan and the needs of the villagers, less impact on environment and ecological functions.An assessment of the existing situation and site selection was carried out during project inception phase in October and November 2010 by revisiting all project target villages to confirm the needs of villagers and suitability of potential sites. 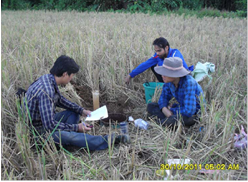 Above criteria were applied to screen the potential irrigation sites. The portion of irrigated area is still small compared to available paddy land. According to the district information in 2010, only 8 schemes with area of 1,350 ha have been irrigated for double cropping per year. This makes up 15% of total paddy land (8,620 ha) in the basin. The rest is classified as rain-fed and upland paddy area with single cropping per year. Most of the exiting irrigation schemes are suited in the low reaches of the basin but not serving for the poor people in the upland area. As result from 8 survey and design schemes, 5 schemes were selected for construction. The reason of dropping 3 schemes was the budget availability. In addition, through the screening of IWRM concept, pumping scheme was dropped out due to the concern of minimum flow which intends to take from the main stream and this will be reducing 10% of flow quantity in the dry season. 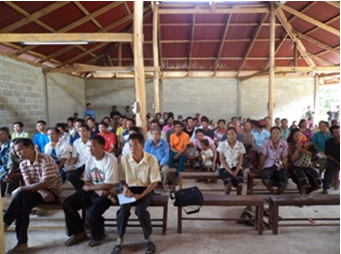 Before construction work was initiated, the orientation meetings were organised during October and November 2012 to keep farmers informed about the field work activities and possibility of villager’s contribution. The affected families due to construction work were also reviewed. The villagers/beneficiaries showed high commitment of participating in the project activities by contributing volunteer labours about 2-3 persons-day in a construction site. 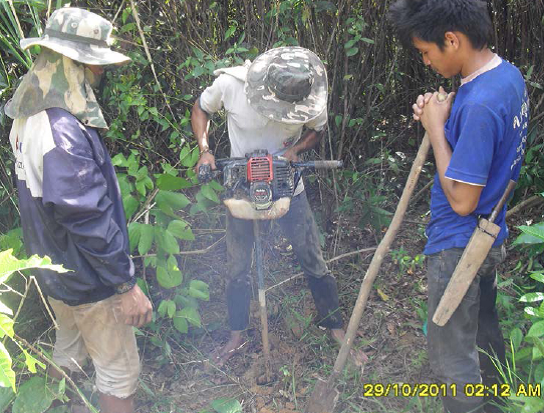 Village authorities played a major role in coordinating with District staffs and assisting the conflict solution which was often happened during construction period. The type of confliction includes e.g. 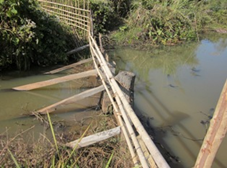 complaining of due to the loss of land and properties caused by canal alignment passing, erosion leading in paddy field, etc. Due to budget availability and environmental issue, 5 out of 8 schemes were chosen by the Steering Committee Meeting in February 2012 for being constructed. 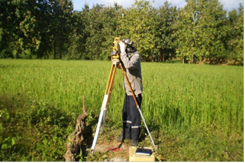 Irrigation schemes is mainly designed for supplying water for dry-season cultivation but also for supplementary supply water for wet-season cultivation. Due to the water storage capacity and delivered facilities, it is estimated that 138 ha can be benefit from the project’s irrigation system development. During wet season, a large area can benefit through higher water availability. In total, about 139 households are calculated to benefit. 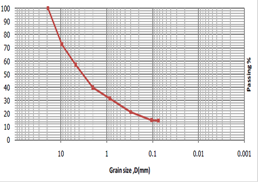 The minimum flow was assessed to avoid negative environmental impact from irrigation development. 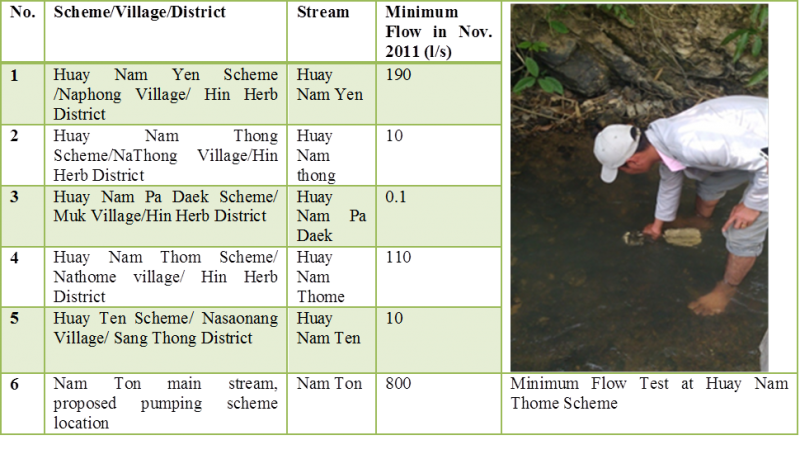 The minimum flow is used for estimating the capacity of irrigated area and as a basis for scheme operation during the dry season in avoiding downstream impact. Irrigation development can serve different purposes. 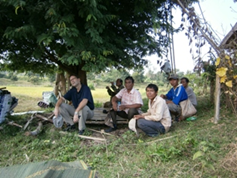 For Lao PDR, it mainly targets for rural development on generating income opportunity for local people. 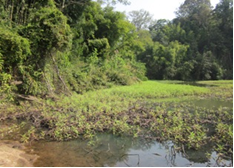 In watershed management, irrigation is not only designed for production achievement, it is also used for ecological function maintenance e.g. 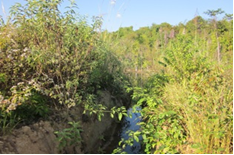 increasing water availability, maintaining minimum flow at downstream and avoiding negative impact on biodiversity. 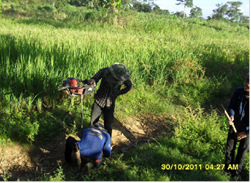 The development of irrigation schemes is therefore one of the approaches supporting livelihood improvement in the watershed by improving farming systems and generating income opportunities for local people and to reduce shifting cultivation. 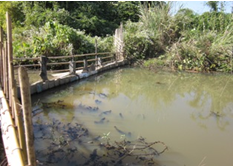 The introduction of irrigation systems is also to improve the ecological function of the watershed by increasing water availability in the dry season and reducing flood events in the wet season. The existing irrigation schemes are (mainly paddy fields) limited due to the mountainous area. Most of this area is managed with upland agricultural techniques (shifting cultivation). Based on the results of the satellite image interpretation, only 1,300 ha are currently irrigated. 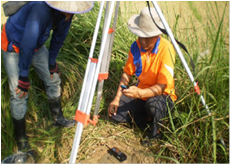 Most irrigation schemes are situated at the lower reaches of the watershed area along the Mekong River which are not serving the poor families in upland areas and do not significantly support maintaining the watershed functions. 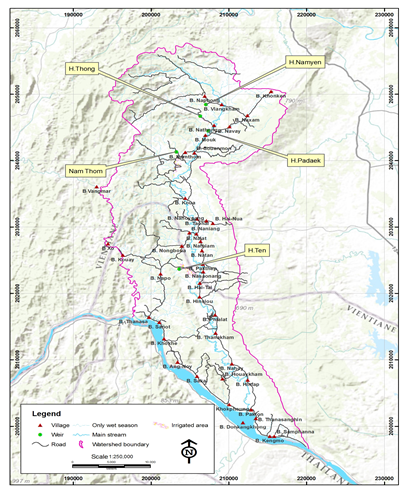 More than 70% of the current irrigated area is served by pump schemes, which are generally not well operating and maintained, also due to weak water user group structures and limited support from the GoL DAFO extension service. 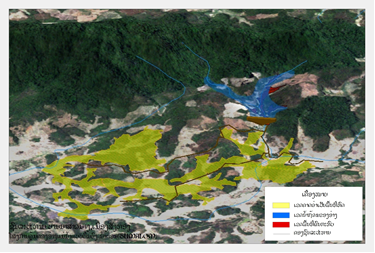 The need for irrigation development under SUMALOM-Nam Ton Project was included in Project Feasibility Study in 2007. 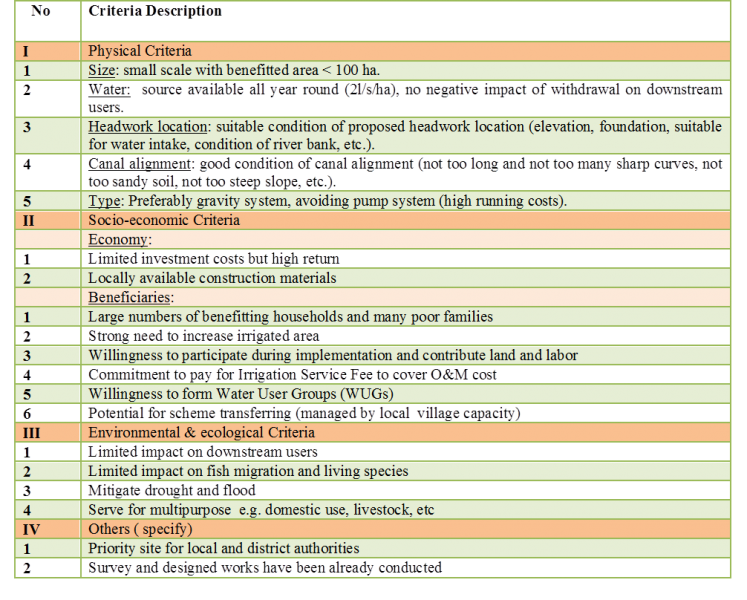 According to these plans, most of these proposed schemes are placed in the lowland and not benefitted to the poor. The concept review for irrigation implementation was carried out during project inception phase by prioritising the scheme development in the upland and befitting to the ethnic poor groups. During SUMALOM project inception phase, 8 priority schemes were selected for extension and/or improvement of which 5 schemes were recommended for further implementation.